Our Driftwood Sailboats are all Hand Made. 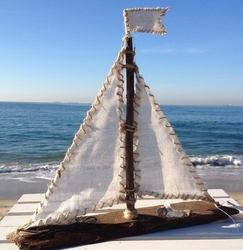 We use the finest quality Fabric on our Sails and hand collect each and every piece of Driftwood along the California Coast from Laguna Beach to Malibu and because of this no two Sailboats will ever be the same. Fabric print placement and Driftwood may vary, but we assure you each and every Sailboat is just as nice as you see here. Each Sailboat measures approximately 14-16 inches in width and height. Need another size, just let us know. The Sails are made of jute trimmed Linen.